When it comes to owners choosing unique names for their yachts, there’s no lack of inspiration. From the obvious ( LADY SARA, LISA IV, et al) to the sublime (e.g. CLOUDBREAK, PARADISE, et al), the only limit to a creative name for a yacht is the owner’s imagination. While we’ve seen yachts named after famous movies, animals, and people, we have to admit – a yacht named after a candy bar is unique and rare! 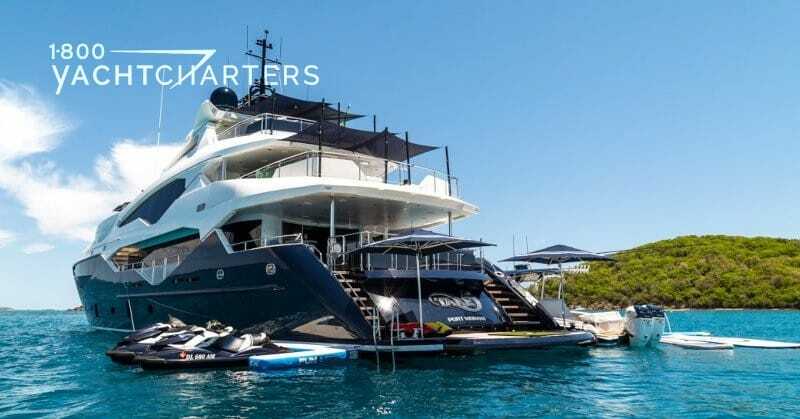 So, our team had to chuckle when a beautiful new yacht recently entered the luxury yacht charter marketplace, sporting a name inspired by a popular candy bar found in your neighborhood grocery store. The Sunseeker 131 motor yacht TAKE 5 shares a name with the well-known Hershey Company candy bar. Seems both manufacturer are equally proud of their creations! Since her launch in 2016, yacht TAKE 5 Sunseeker 131 was strictly used for the personal enjoyment of the owner and his family and friends. Now that the yacht is available for luxury yacht charter, it will be based in the Caribbean during the winter/spring, and in the Western Mediterranean in the summer. By the way, in case you thought it was just a coincidence that the yacht and candy bar share a name – individual snack sized Take 5 candy bars fill crystal candy bowls throughout the superyacht! The Superyacht Experience… Nothing blends the chance to experience new cultures and reconnect with friends and family like a luxury yacht charter vacation. For more information or to arrange your own superyacht experience, contact 1-800 Yacht Charters at +1-800-922-4824 or +1-305-253-7245 today.